Poster showing ‘Aharanovitch is brave when facing children’. theatrical protest, June 27th 2013. Photo: Guy Butavia. Last week my blog, ‘The Silliness of ‘Security’ and Puppets for Peace’, poked fun at Israeli Public Security Minister Yitzhak Aharonovitch for banning the 19th annual Palestinian children’s theatre festival by closing temporarily the El Hakawati theatre in East Jerusalem, where it was to be held. The minister’s repressive order exposed the ridiculousness of Israel’s security doctrine, showing how empty Israeli government claims are about acting in self-defence. A theatrical protest against the closure used the slogan ‘Aharanovitch is brave when facing children’. Wadi Maswadeh being led to detention. No photographer credited. There is a direct connection between his preventing the staging of children’s theatre for Palestinian children and the real-life drama that was documented earlier this week on video by Palestinian field researchers for the Israeli human rights organization B’Tselem. Israeli soldiers from the Givati Brigade stationed in Hebron detained Wadi’ Maswadeh, aged five years and nine months, after he allegedly threw a stone at an Israeli car. The soldiers remained impervious to Wadi’s tears and the pleas of onlookers not to arrest such a young child, who was crying as he was placed in an army jeep and while the soldiers waited in his home for his father to return. For a couple of hours, the boy suffered much distress, until the soldiers handed him over to the Palestinian police (who then released him), but only after his father was bound and blindfolded en route to the Palestinian police. The seven Givati boys were also brave when confronted with a child well below the age of legal criminal responsibility, which is twelve. Hebron map. Source: Peace Now website. The ‘security’ that the Israeli soldiers in Hebron serve is certainly not the security of its Palestinian residents, nor of the State of Israel; it is the security of the several hundred Israeli settlers in the H2 area of Hebron. 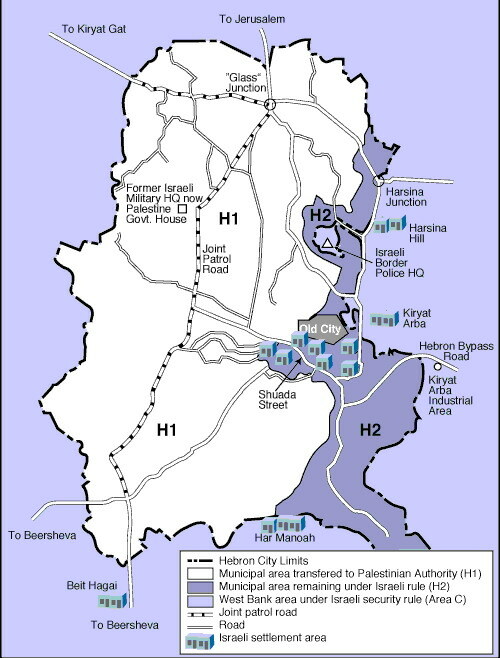 H2 was established by the 1997 ‘Protocol Concerning the Redeployment in Hebron’, a follow up to the Oslo II interim agreement in 1995. Under the terms of the complex agreement, Israeli military forces redeployed from much of the city, designated H1, but maintained military control of H2, then home to some 30,000 Palestinians, as well as much of the city’s commercial life, along with the handful of buildings in which the settlers live. Not surprisingly, there has been constant tension and periodic violence between the Jewish settlers and the Palestinian residents. Israeli security measures on behalf of the settlers, which severely restrict freedom of movement and entail excessive use of force, in addition to lack of law enforcement in response to settler violence, have made life unbearable for the Palestinians, many of whom have abandoned the area. Hence, the videos documenting Wadi’ Maswadeh’s detention show almost deserted streets, while the solders’ behaviour partly explains why the area is so empty. what is most shocking about this incident – besides the very fact that soldiers detain a five-year old child, shocking and horrible in and of itself – is how calm everything is. There was no violence exerted by the soldiers … the soldiers, don’t seem to think there’s anything wrong with the scene they are actively engaged in; it doesn’t occur to them to question the actions. One has to be in an extreme state of apathy toward that child in order to treat him like that. And apathy like that can only be the product of racism. Figures released by Hatzalah [Rescue] Yehudah and Shomron, a volunteer emergency medical response organization in Israel [sic], show that there were 5,635 attacks in the first half of 2013 against Jewish residents of Judea and Samaria, Jerusalem, and the greater Jerusalem region. To drink tea with Palestinians would be a step towards acknowledging that their lives matter too, and that they too deserve security and workable living conditions. But the occupation in general and H2 could not be sustained if the brave Givati boys and the rest of the occupation forces recognised that Palestinian lives are as grievable as Israeli lives, and that Wadi’s tears and fear should be felt as keenly as those of their own younger siblings. This entry was posted in Anti-occupation and tagged +972 blog, Ami Kaufman, B'tzelem, Givati Brigade, H2, Hebron, Israel/Palestine, Judith Butler, Mairav Zonshein, settlements, Wadi Maswadeh, Yitzhak Aharonovitch on July 12, 2013 by Jon Simons.